I’m excited for my upcoming journey to Japan this autumn on British Airways’ First – who wouldn’t be? Flying away on holiday may sound like a busman’s holiday for me, particularly as I’m in the business of travelling for, well, business – but I’m looking forward to ten hours of luxury and perhaps trying to trump my champagne per mile travelled record. I learnt today that I will be sipping my Laurent Perrier Grand Siècle in brand new glassware, commissioned by the airline as an upgrade in their First cabin. British crystal specialists Dartington Crystal has served up a new range of luxurious glasses and most surprisingly in a twist for the understated airline, a deep crimson water glass. Dartington Crystal, a leading exponent in British design, is best known for its premium crystal. Each of the company’s glasses featured in First is individually stamped with both the British Airways speed marque and the Dartington name. Originally called Dartington Glass, the company started in 1967, in Torrington, Devon in the South West of England. British Airways also offers customers flying in First a sophisticated and stylish suite, featuring a contemporary British design, allowing them to work, relax, dine and sleep in comfort. 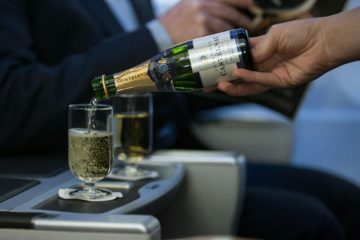 As well as a bespoke service from attentive cabin crew, à la carte dining, fine wines and champagne, customers can also unwind in their six foot fully-flat bed to feel revived and refreshed once their flight arrives at its destination.